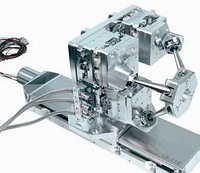 PI is the world leader in precision parallel kinematics and Hexapod Stewart platform system design. PI's core business is ultra-precision motion control. With more than 950 employees world wide, 40 years of experience in motion control and more than three decades of hexapod mechanics, controller and software design experience, PI can get you up to speed significantly faster than anybody else. PI recently acquired miCos, another motion control specialist with hexapod parallel kinematics design experience, and a broad product offering of high-vacuum and ultra-high-vacuum (UHV) precision positioning systems. PI's electro-mechanical and piezoelectric Hexapod (Stewart-Gough) platform positioners have many advantages over hydraulic hexapods. They are smaller, offer much higher precision and most are self locking. Available in many sizes, configurations for loads from 2 kg to more than 1000 kg. Most of the following Hexapod Platforms are standard catalog products. Click here for additional High Force Hexapods, Special & Non-Magnetic Hexapods.